A motorist who murdered a love rival when he ploughed into his bicycle at 40mph has been jailed for life. Sam Spaven drove his Audi into Richard Pencott, 44, as he rode home from work in Harworth, Nottinghamshire, in June. Nottingham Crown Court heard Spaven had become abusive to his ex-partner when he learned she was seeing Mr Pencott. 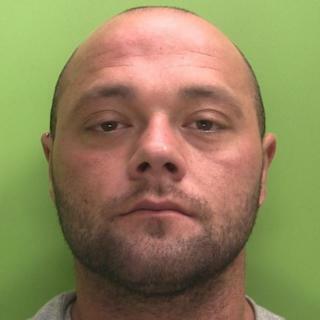 The 27-year-old, of Bircotes, Nottinghamshire, pleaded guilty on the first day of his trial and must serve at least 25 years behind bars. Spaven has a son with his former partner Amy Sherwood but the court was told they split up in April. He became angry after finding out she had been seeing Mr Pencott, a former work colleague of his. On visiting her home, he told Ms Sherwood "I'm going to chew your face off'" before threatening to kill her and Mr Pencott, Michael Evans, prosecuting, said. Spaven returned the next day and was told to leave around the time Mr Pencott was finishing his shift. He then posted on Facebook: "Richard Pencott and Amy Sherwood have broken me and my family apart and my boy" before driving to "exact his revenge", Mr Evans said. He mounted the pavement in Blyth Road and drove into Mr Pencott's bicycle, which landed the other side of a 10-foot fence. The father-of-two died almost instantly from head and chest injuries. Spaven then drove to work at a gym in Rotherham, where he was arrested. Witnesses reported seeing damage to his car's windscreen and a big dent in the body work. Judge Michael Stokes said it was "premeditated, deliberate murder." "Why? Because you, obsessed as you were with your former partner and mother of your child, were blinded by jealousy and bent on revenge." A statement from Mr Pencott's family described him as "honest and hardworking" and called the murder "unprovoked and cowardly".